Practically the first task assigned to him was to staple booklets. He later went on to typing manuscripts, transcribing Srila Prabhupada’s dictation for books, and then typesetting, proofreading, managing book production, and editing. He has lectured extensively at colleges and universities, especially in the United States. In 1978 he accepted the order of renounced life, sannyasa. In 1985 and 1986, he spent a year and a half traveling with a party of pilgrims on pada-yatra, a journey on foot, through various states of India, stopping in a different town or village every night. In 1987, along with Dhanurdhara Swami and Bhurijana Dasa, he co-founded the Vrindaban Institute for Higher Education. 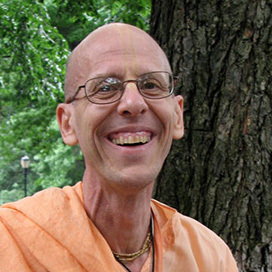 Since 1988 he has served as a director of Srila Prabhupada’s publishing house, the Bhaktivedanta Book Trust. He now oversees the work of the BBT in Africa. From 1991 through most of 1998 he served as editor in chief of Back to Godhead magazine, for which he had been an assistant editor for several years. He served as the senior editor of a three-volume translation and commentary (publication completed in 2005) for Sri Brhad-bhagavatamrta, a sixteenth-century Sanskrit philosophical and devotional work by Srila Sanatana Gosvami, and, by the same author, Sri Krishna Lila Stava (published in 2008). He has also served as the senior editor for Srila Jiva Gosvami’s Tattva-sandarbha (published in 2013). His main editorial service now consists of training new editors. He does not initiate disciples. Apart from his services in publishing, he travels widely, teaching about the philosophy and culture of Krishna consciousness.